Visually, this is a classic Strijbos bottle puzzle – there’s the familiar little lock dangling from a red rod inside the bottle, and the rod protrudes through the cap so it can be manipulated, a bit. In the bottom of the bottle there’s a ball bearing and at the start there’s a key dangling from a key ring attached to the top of the rod, and a key inserted into the lock in the bottle… unusually for Wil, there’s a hole in the bottom of the bottle (it’s harder to make those in the bottom of a cola bottle, although that apparently hasn't stopped him in the past!). Sadly the hole isn’t large enough to allow the ball bearing to pass through it … and your first task is to get the ball bearing out. 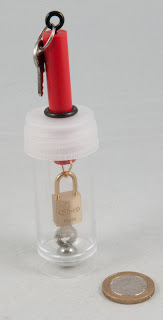 There’s a fair amount you can do to begin with and it’s quite tempting to start by just unlocking the padlock inside the bottle, after all there’s helpfully already a key in there … except that’s not quite as successful as you might like. As with all of Wil’s bottle puzzles there’s a goodly measure of times where you need to take a chance on something, not really knowing whether you will be able to undo any potential damage you might wreak … but rest assured, Wil’s designs don’t usually allow you to do anything that is totally irreversible… basically, don’t do anything stupid and you should be OK.
There’s a fantastic little “A-Ha!” moment near the start of the solution when everything in Wil’s Exchange description finally all fits together and makes sense – which is nice because it lets you know that you’re on the right track! Of course it’s by no means easy from there on, in fact some bits are still fiddly as heck – but they’re significantly simpler than some of those cola bottles! 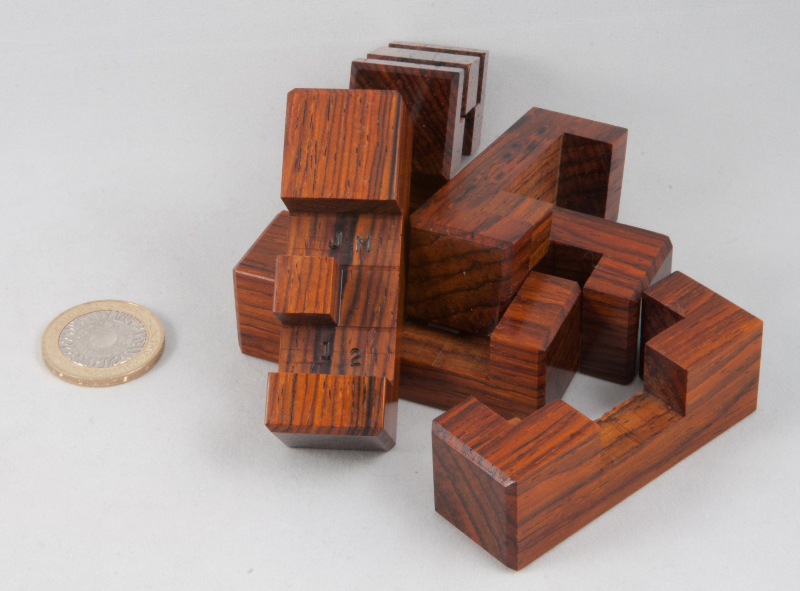 I know I’m biased since I was part of the crew dishing these out in the Exchange at IPP32, but I think this is a terrific little puzzle – there are effectively a series of little puzzles to solve along the way to work out how to proceed and thinking a bit ahead is generally a wise move. The recent round of First Boxes that Wil produced had a steel rod inside it that was your goal … you could see it inside the box sliding back and forth and you were trying to find a way of liberating it from the box. 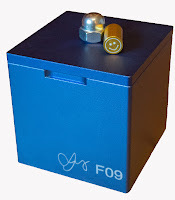 In the interim Wil’s come up with a much cuter alternative: a gold anodised rod with a smiley-face on one end and a sad face on the other end. At the start the sad face is visible through the hole in the bottom of the box, and your goal is to find, and release, the smiley-face. 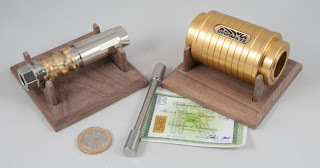 The next round of First Boxes will all come with the new style rods, but if you happen to have one from the first round and haven’t already got a replacement rod, drop Wil a note and he’ll let you have one of the slightly cuter versions free, gratis and for nothing. Before I went along to IPP32 I’d arranged to buy one of Neil’s latest creations, Hex Stairs, designed by his mate Derek Bosch. Neil’s written a series of terrific blog posts starting over here chronicling his build and finish process on these puzzles ... including the production of the first prototype that turns out a bit larger than he’s expecting – so large in fact that you can put a bottle of Guinness inside it ... although someone seeing that picture has lead to Neil being commissioned to build a super-sized version to fit around a wine bottle ... the mother of all Hex Stairs? Neil brought out a couple of copies on the Wednesday evening in the bar and I chose a great looking copy in wenge, purpleheart and curly maple. Neil’s clearly spent a lot of time on the finishing and he’s brought out the life in the woods he’s used. I like the combination of the deep, dark wenge against the reasonably deep purpleheart, being totally offset by the maple in the middle band. Derek’s design bears some similarities to Oskar’s Domino Tower – if you change the shapes of the tiles, and work in hexagonal structures rather than squares, and add a layer – so really it’s not like Oskar’s Domino Tower at all! Hex Stairs consists of 6 (hex!) winding pieces in alternating colours that interlock to form a stable hexagonal tube. Given the way the colours alternate, there are a few different ways to arrange the pieces – but you’ll always have the maple band around the middle. The shapes of the pieces are such that if you handle the assembled tube naturally, it will stay pretty resolutely together (the natural grip pushes opposite sides together, and as long as you’re spreading that pressure across more than one layer, it pushes together). If however, you start putting pressure across individual layers, you’re likely to find, as Jim did in the bar that night, that this sucker’ll come right apart on you! And once it starts coming apart, you’re better off letting it come all the way apart because putting it back together needs all of the pieces to be rather neatly aligned before you can slide them all together. That need for absolute alignment was my undoing when I was fiddling around with Neil’s mini-sized copy of Hex Stairs in the bar that night – his tolerances were unbelievable on that skinny little copy... thankfully mine's a little more forgiving so I can actually reassemble it without too much fiddling around looking like I haven’t a clue what I’m doing! 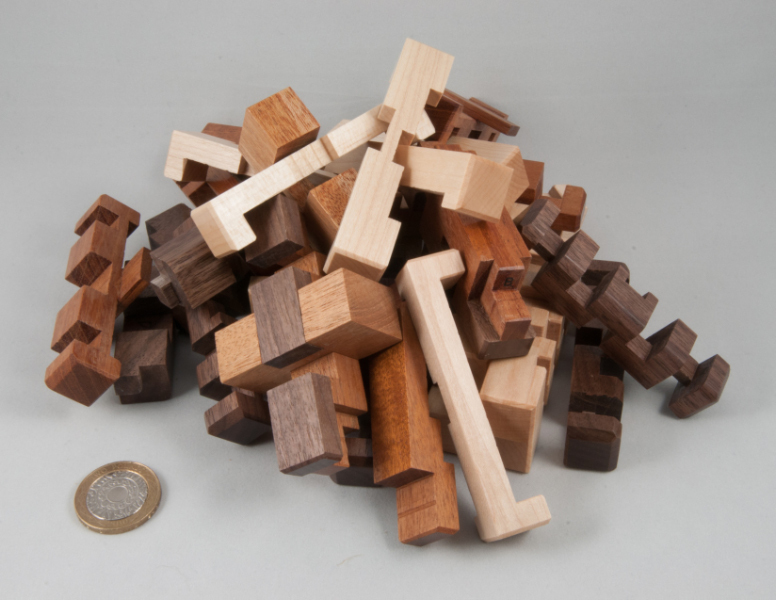 It’s a cute design from Derek – it definitely adds a bit more of a twist to things than Oskar’s Domino Tower and the extra pieces make it a bit more interesting to get things lined up neatly enough ... and terrific craftsmanship from The Juggler ... Thanks Neil for my second Juggler-crafted-puzzle! ... I also got a couple of walnut Revomaze stands that Neil offered to build after the guys at Revomaze stopped offering wooden stands before they stopped selling puzzles – resulting in a few of us having nice wooden stands for some of our puzzles and leaving the rest of them rolling around on a shelf. 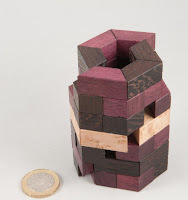 The stands are pretty similar to the original stands so they fit right in with all the others and provide snug support to a couple of rather nice little puzzles ... and came in handy recently to take some pics of the latest one being opened... Cheers for that too, Neil. 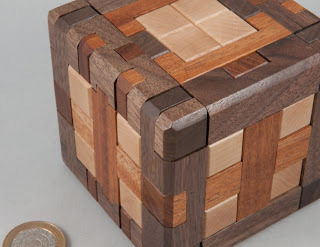 This year’s Nob Yoshigahara Puzzle Design Competition included a couple of new designs from Japanese puzzle-designer extraordinaire Hirokazu Iwasawa, better known in the puzzling world as Iwahiro. 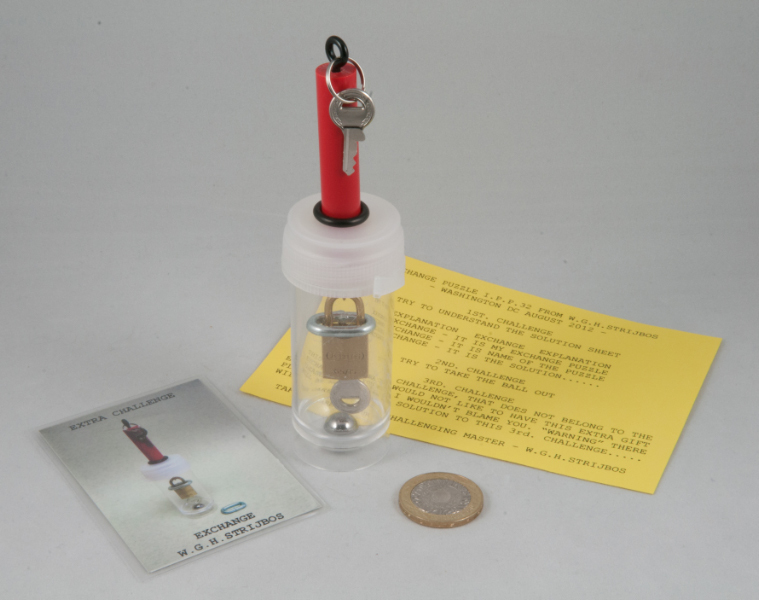 Tritalon first appeared a couple of weeks before IPP32 in one of Wil Strijbos’ regular newsletters – Wil offered it as a new take apart puzzle from Iwahiro and a bunch of us piled in as usual ... only to spot it a little while later entered into this year’s Design Competition. 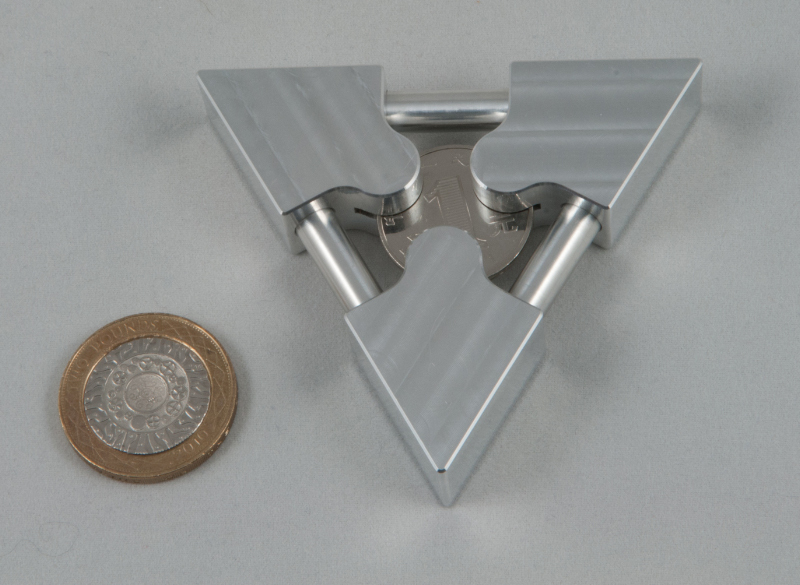 Tritalon is nicely machined in aluminium with the three corner pieces each having a slot in the centre used to trap the one Yuan coin. The corner pieces are neatly finished off with a gentle chamfer to stop you from scratching anything important and they’re joined to one another by a series of rods. It looks pretty neat and it’s the sort of puzzle you can safely give non-puzzlers, for two reasons: firstly it’s unusual shape invites inquiring minds and secondly, it’s pretty hardy! Looking at it you’ll probably come up with a theory on how it’s going to be opened, and chances are you’ll be right, but depending on who had it last, it might take you a while to test your theory... one of my comments about this puzzle are that I like the fact that it rewards patience – you can’t rush this puzzle, if you do, it sulks and you have to slow down... embarrassingly that little ‘feature’ confused me for a while and it was only when one of my puzzling mates inflicted my own usual advice on me (THINK!) that I realised that I was causing my own problems and had it open pretty soon after that. My second Iwahiro gem was one that I’d been on the lookout for for a while – Alcyl. 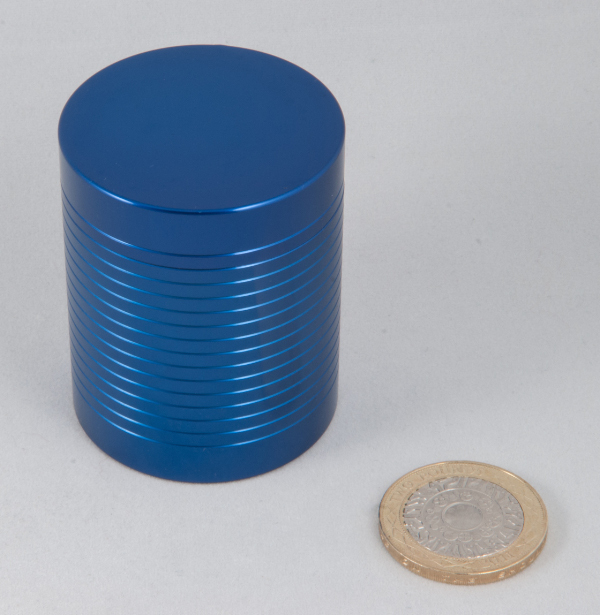 This little blue aluminium cylinder seems to have utterly confounded quite a few folks after it was Iwahiro’s IPP29 Exchange Puzzle. There’s something rattling inside the cylinder and even the most careful inspection of the exterior gives no clues as to how the puzzle opens... it’s not a hugely complicated mechanism, but it will trap the unwary for a while – and I really enjoyed the little twists and turns along the way – each time you think you’re home and dry, it tosses another little curveball at you. Very glad that Iwahiro had another run of these great little puzzles made up. ...to everyone who was such a good sport at IPP and agreed to pose for a picture with my odd little Joker. For those who weren’t there, or I somehow managed to miss: I’d taken along a puzzle box made by my puzzling-mate Louis, and anyone who had a go on the A-Mazing Box #3, or who got one of Louis’ impossible folding cards from me, was asked if they’d mind posing with a Joker that Louis had included in the final batch of cards he’d sent to me. On this particular Joker he’d written “Thanks for taking me to the IPP! Regards Louis” so I decided it would be a good idea to take the Joker along and get some photos of folks holding up the card. ...so pretty much everyone who played with the box or who got an impossible card from me were asked to pose for their picture with the Joker and then told the story behind the strange photographic request ... 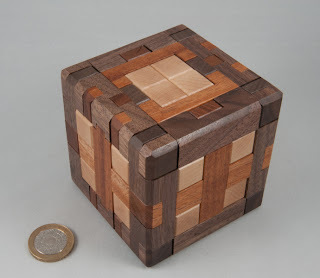 I found it pretty cool that everyone instantly agreed to the odd request, and when I told them about my little project afterwards, they were all chuffed to have been asked to take part as well... ergo Puzzlers are Cool! 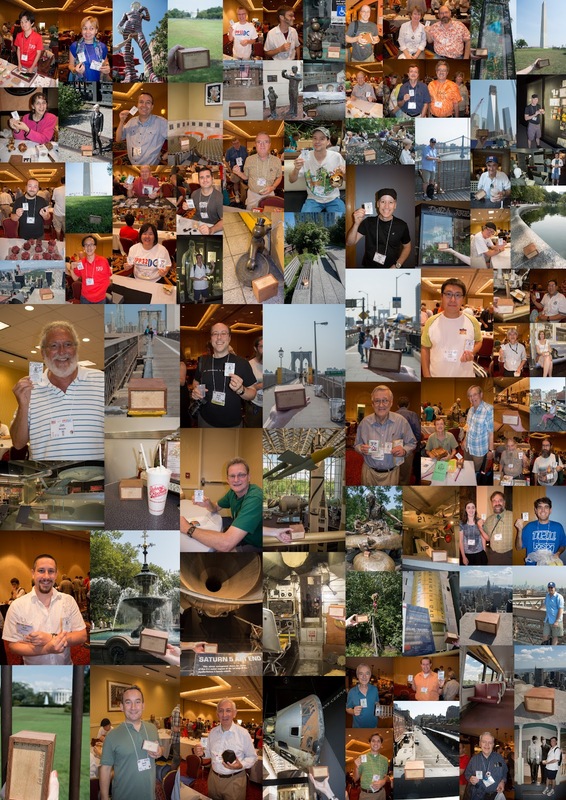 After I got back from IPP it took a couple of weeks to line up all the photos, get them properly photo-shopped and arrange the layout of the book for printing – and in the mean time I’d started posting some of my pics on the blog and Louis invariably spotted some of the pics with puzzlers from around the world holding what looked like the card he’d sent me ... so he asked about it and I told him to mind his own business! Well, this past week the book (Awesome American Adventures of the A-MAZING BOX #3) was finally delivered to Louis and I think he likes it ... so thank you to all of the folks who helped me out at IPP by posing with an odd Joker – you’ve helped me give one of my puzzling mates a really cool gift – thanks!. Back in late 2011 one of my local puzzling mates got in touch and made me an offer I was never going to refuse – he’d been in touch with Jerry McFarland and Jerry had come up with a new puzzle design that he was looking for some feedback on ... so in return for some thoughts on the puzzle, I’d get to play with something totally new, and as it turned out, an entry in the 2012 Nob Yoshigahara Puzzle Design Competition. I spent a while playing around with the puzzle and eventually had to give it back to Chris, so I jotted a few notes off to Jerry more or less along the lines that I thought it was a cracking puzzle and if he ever decided to make any available for sale, I’d love to get hold of one... I couldn’t suggest any improvements and told him I particularly liked the two stages in the puzzle – and that the second stage was anything but simple... Chris on the other hand had been far more helpful, and had in fact managed to suggest the name that ended up sticking: BurrBlock. Jerry must have had some similar feedback from the other folks he was talking to because the eventual design that he entered in this year’s IPP Design Competition was more or less unchanged from the one that we played with almost a year before – in fact the only differences were so subtle that Jerry had to point them out to me – and they were about reducing the number of parts in the manufacturing process and didn’t change any of the puzzling aspects at all... so Jerry pretty much got it spot on from the start of this development – well done that man! Several months later Jerry got in touch and offered to sell me a BurrBlock and I jumped at it right away... it’s not a small puzzle – heck, it has 37 interlocking pieces and Jerry’s description suggests it’s a “very difficult to take apart cube”. Having removed the four key pieces you might be forgiven for thinking that the frame will begin coming apart ... and you’d be quite wrong – it’s still pretty sturdy and doesn’t give much in the way of clues as to how it might begin coming apart – and that’s the feature that really sold me on this puzzle when I first played with it – it toys with you! Lets you think you’re getting on top of it only to sit back and laugh in your face! 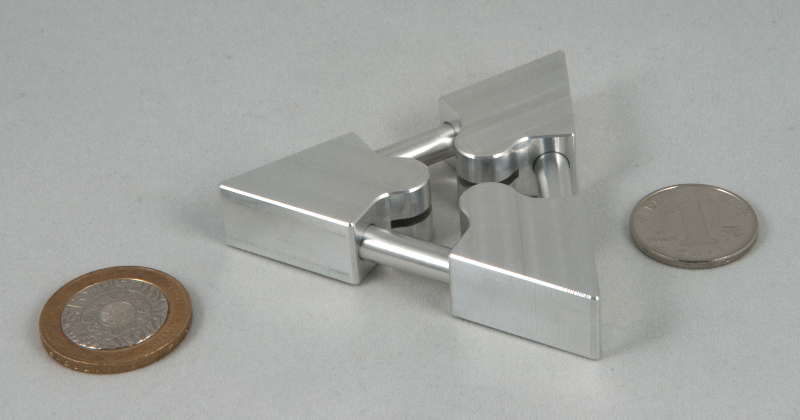 Jerry’s description of the second phase of the puzzle includes phrases like “fifteen non-obvious steps” being required to disassemble the frame – no kidding! Finding how to start disassembling the frame is almost worth the entry price on its own ... and when he says “non-obvious”, that’s a pretty decent understatement – it’s pretty darn unusual! 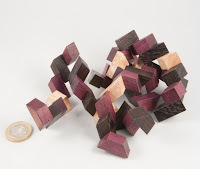 Persevere and you can reduce the frame to a large pile of uniquely McFarland shaped bits – some of which you aren’t likely to have seen the likes of before – very ingenious and makes for a great puzzle. 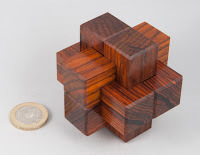 As usual all of the pieces are perfectly machined on Jerry’s home-brewed CNC kit and beautifully polished in the usual McFarland manner – making for a lovely three dimensional sculpture in walnut, mahogany and maple. 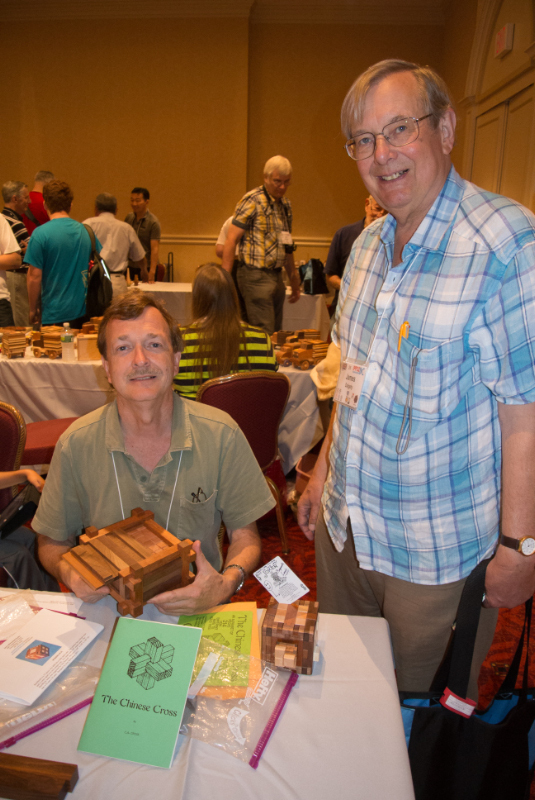 When I met Jerry in Washington DC he mentioned that he’d made up a couple of Piston Burrs and had brought a few in Ebony and Kingwood along for sale at the Puzzle Party on the Saturday, so I made sure that I visited his table reasonably early on in the day. At IPP32 Jerry also had a prototype of a new project he’s been toying with for a little while now – a burr set in a puzzle box. 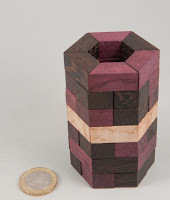 He’s designed a box that is itself an interlocking burr arrangement that then holds a set of 42 burr pieces ... and the prototype is looking pretty promising already. Hopefully enough folks will have made enough encouraging noises to Jerry already to help him decide to go ahead and make some of these, but on the off chance that he hasn’t been pushed over the edge, if you’re interested, then please let him know via his web-site and offer him some encouragement.